Home » Our Doctors » Dr. Sarah DiPonio-Tulchinsky, O.D. Dr. Sarah DiPonio-Tulchinsky grew up in Plymouth, MI where she attended Salem High School. She received her Bachelor of Arts degree from Kalamazoo College with a major in biology and minor in sociology. She then moved to Chicago, IL where she earned her Doctorate of Optometry degree from the Illinois College of Optometry. While at the Illinois College of Optometry, Dr. DiPonio-Tulchinsky was active as a clinical tutor and pre-clinical teaching assistant. She was selected to participate in a pediatric outreach program where she administered complete eye examinations to children ages zero to five at various preschools. She received clinical honors in primary eye care and contact lenses, advanced eye care, and low vision. 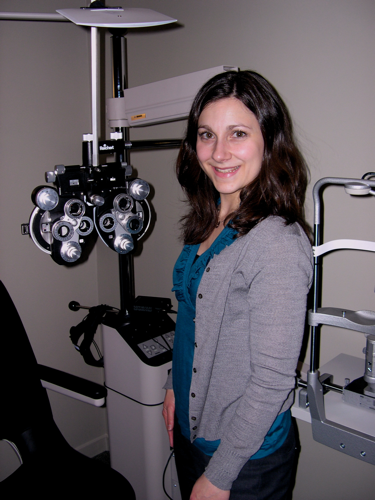 Dr. DiPonio-Tulchinsky is dedicated to the profession of optometry and providing superior patient care. She especially advocates the importance of comprehensive eye exams for young children before entering kindergarten and enjoys providing pediatric eye care. Dr. DiPonio-Tulchinsky is an active member of the American Optometric Association, the Cornea and Contact Lens Section of the American Optometric Association, the Michigan Optometric Association, and the Plymouth Community Chamber of Commerce. She lives in Downtown Plymouth with her husband, Mike and her three young children. She enjoys running, taking walks through town, cooking and spending time with her family.